"Big Hero 6" is the big animated feature film release of the year. With nothing coming from Pixar this year, and DreamWorks Animation focusing solely on sequels, "Big Hero 6" is the film that animation fans are most intrigued by. It is the first Disney animated film in conjunction with Disney's acquisition of Marvel and could begin a brand new franchise. After the stunning success of Disney's "Frozen" last year, expectations are high. Disney has been releasing artwork in dribs and drabs. The European poster gives the best view so far of the city of San Fransokyo. 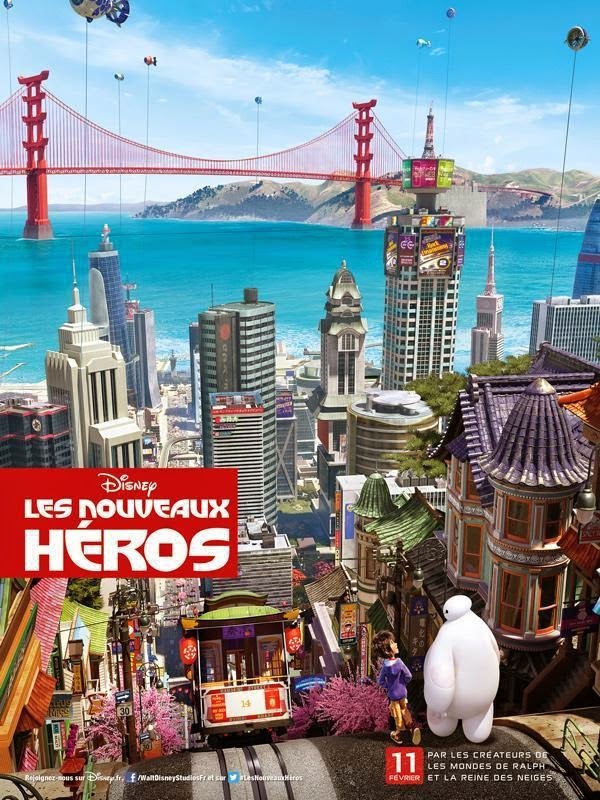 “With all the heart and humour audiences expect from Walt Disney Animation Studios, “Big Hero 6″ is an action-packed comedy-adventure about robotics prodigy Hiro Hamada, who learns to harness his genius—thanks to his brilliant brother Tadashi and their like-minded friends: adrenaline junkie Go Go Tamago, neatnik Wasabi, chemistry whiz Honey Lemon and fanboy Fred." The release date for "Big Hero 6" is November 7 (US). 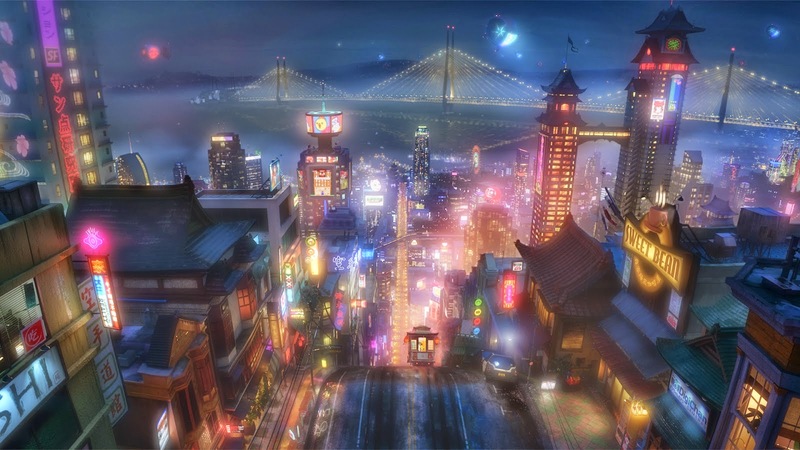 From Walt Disney Animation Studios comes "Big Hero 6," an action comedy adventure about brilliant robotics prodigy Hiro Hamada, who finds himself in the grips of a criminal plot that threatens to destroy the fast-paced, high-tech city of San Fransokyo. With the help of his closest companion—a robot named Baymax—Hiro joins forces with a reluctant team of first-time crime fighters on a mission to save their city. Inspired by the Marvel comics of the same name, and featuring comic-book style action and all the heart and humor audiences expect from Walt Disney Animation Studios, the CG-animated "Big Hero 6" hits theaters in 3D on November 7, 2014. This is bad considering I'll be in China when the movie hits November, and I won't be back until mid-2015. What if it doesn't show there at all? I've been looking forward to Big Hero 6. In the past, big Disney holiday releases have played in China during the "Chinese Lunar New Year Golden Week" (Chinese New Year) which begins in January or February. People have more time to see it during that holiday. I haven't seen anything specific, but it would make sense for it to be released in China around that time. Unless China has some kind of issues with Disney as has happened in the past, I am 100% certain the movie will be in China. Yeah, I wonder about that. Because looking up on China's release dates when it comes to Disney (and Pixar) movies, they've been...inconsistent, to say the least. Let's take a look at some of the past Disney (and Pixar) movies China release dates in comparison to their USA ones, according to IMDB, as far back as 2010. EXTREMELY inconsistent. If there was an actual pattern to follow that'd be fine, but no. Heck, there's some that didn't even get released in China to begin with. So we're still up in the air as to when Big Hero 6 will come out. Heck there's also the matter of Pixar's upcoming Inside Out, scheduled to be released June 2015. What about that one? Big releases in China from all the studios are a matter of official decision by the Chinese government, which decides when and how films are released. That may sound odd, but that is how it is done there. They may allow a film to be released, but in a poor time slot (i.e., away from their Golden Week period). Or, they may not allow it at all. Relationships with the Chinese government are vital. Disney has a mixed history in that area. For instance, there was friction between Disney and the Chinese government about the release date of "Mulan" in the 1990s because of "Kundun," a Disney-funded biography of the Dalai Lama that the Chinese government considered politically insensitive. Mulan (which many Chinese did not like for a whole host of other reasons) wound up being released after the Chinese New Year, allowing local films to get the big box office. It was the equivalent of postponing a superhero movie into September or February here - yes, it got released, but at a lame time of year. I'm sure they are talking about it, and that Disney is trying to get a good slot. I don't have any idea how the Chinese view the Asian characters in "Big Hero 6" - incredibly, they sometimes demand alterations of characters they don't feel are appropriate before setting the big release date. I doubt anyone knows when it will come out in China, even at Disney. The Chinese bureaucrats may be thinking about it. I still haven't heard anything. Blegh, as a movie reviewer and a Disney fan in general who has been looking forward to this ever since it was announced, this is disappointing. Oh well. Considering that IMDB's China release date list so far doesn't have Big Hero 6 among them, not even in February 2015, that doesn't make the whole thing any better. 1962 Comedy Routine Animation "Sale of Manhattan"
Early Jim Henson Animation "Drums West"
"The Animated Adventures of Dr. Who"